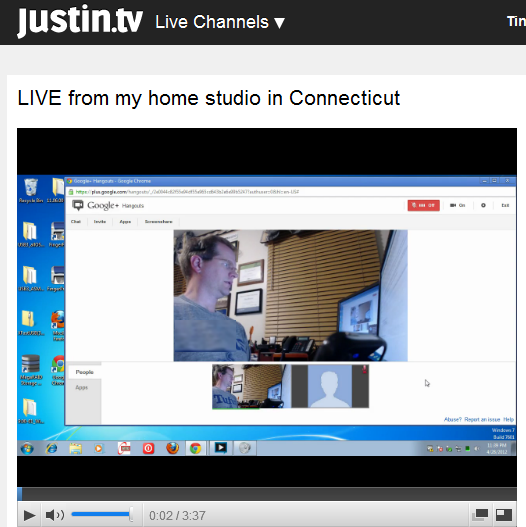 Today, I performed a continuation of my Google+ Hangout tests last weekend, and this week with Jim Collison and Greg Welch. Most of those test are described at TinkerTry.com/google-hangout-testing. It could be a while before Google+ Hangout on Air is available. When it does arrive, with convenient auto-publishing to YouTube, it may not record in high enough resolution to be useful for capturing demonstrations or screen sharing sessions that I'd like to host. So I'm trying out live recording techniques, which I managed to get working tonight, without any fancy audio mixing software or hardware. Just my Logitech C920 webcam and Jabra PRO 9470 headset. If there's enough demand, I'll record a video or screenshots of me setting all this up. Anybody can view the live stream stream and chat with each other, but the Google+ Hangout participants use Google+ Hangout's built-in chat to communicate with one another. Some of my other test videos have some echo, I'll figure out what is causing that after some more testing. But the good news is that it works, and works well. No video editing required on my part, no large FLV files saved locally if I don't wish. And it's ready for anybody to replay, in full resolution, within just a few seconds of my stopping the XSplit Broadcaster. Nice!